The complete jazz and blues recordings made during an ARC field trip to Hot Springs, Arkansas in March 1937. 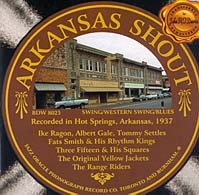 Includes the complete recordings of The Range Riders, Ike Ragon, Three Fifteen and His Squares, Fats Smith, Original Yellow Jackets, Albert Gale and Tommy Settles. Unknown (cl,as), (vln), (p), (g), (sb), (bb), Ruth Byles-Little Willie (v). Both of the vocalists may also play instruments. Little Willie may be Bill Barnes, the composer of The Range Riders’ Stomp. The composers of Who Calls You Sweet Mama Now?, Heath and Walker, as well as Spec Harrison, Gough and Roberts (the composers of three unissued masters) may also be members of the band. Aubrey Yancey-Earl Watkins (t), William Pate (ts), Durant Allen (p), Jesse “Brownie” Saville (g), Wiley Fuller (sb), Theodore Saville (d), Fats Smith (v). Dave Bluntson (p,v) acc. by unknown (t), (ts), (g), (sb), (d). Aubrey Yancey (t,v), Earl Watkins (t), Monroe Fingers (cl,as), Clifton Jones (as), William Pate (ts), Durant Allen (p), Jesse “Brownie” Saville (g), Wiley Fuller (sb), Theodore Saville (d). Ike Ragon (t,arr,v) dir. unknown (t), (tb), ?Paul Thatcher, ?Les Pinter, unknown (reeds), ?Merrill Ramsey (p), ?Jimmy Reda (g), (sb), ?Claude Humphreys (d). Fred Irving may also be a member, unknown instrument. Albert Gale dir. unknown (t). three (reeds), (p), (sb), (d), Marvin “Skeets” Morris (v,unknown instrument). Members of this band may include the following individuals (home union locals given in parenthesis – refer to album notes): Walter Gibbs, L.V. Davidson, O.A. Kopp, C.F. Wobbe, H.G. Diekman, G.L. Warren, and J.E. Pearson (all from Louisville, Kentucky); Norman Mauer (Boone, Iowa), Morgan Berry (Omaha, Nebraska), Clarence Schenk (Evansville, Indiana), Frank S. Lewis (Montgomery, Albama), and James Burlingame (Cambridge, Ohio). Lark Merryman (Fort Dodge, Iowa) was also listed with the Gale band in September 1937, but he joined after the recording session. Note: The ARC files give the composers of matrix HS-67 as Bernard-Wirges; this information does not appear on the record label. Tommy Settles (k, v) acc. by Ezekiel Lowe and Lee Bunkley, (p) and (g), but it is not known which instrument each plays. Note: These masters are both probably dubs of the corresponding take 2s. Tommy Settles (k, v) acc. by Ezekiel Lowe and Lee Bunkley, (p) and (g), but it is not known which instrument each plays. Unknown (wb) added on You Don’t Mean Me No Good.